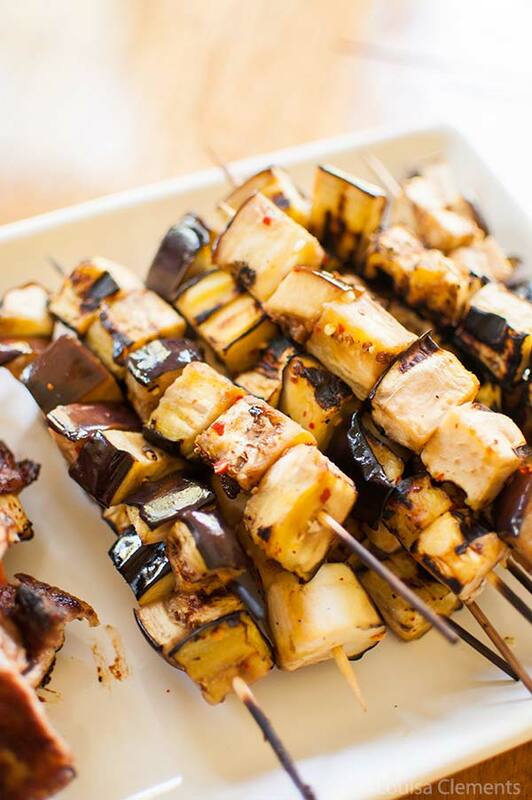 Grilled eggplant skewers a vegan dish, with just five ingredients. These simple eggplant kebabs will please any crowd made with garlic and chili flakes. With this vegetarian recipe for grilled eggplant skewers, I think I’m well on my way to covering off all of the bases for a summer barbecue or potluck. I feel like for the past couple of months, I’ve been grilling up a storm (thanks to all these grilling tips I learned in the winter), but I haven’t shared that many recipes. In fact, I think the only recipe I’ve shared so far has been for my sesame grilled asparagus, which is a pretty great place to start if I do say so myself. I find myself testing quite a few recipes on the barbecue every weekend (that the weather permits, it’s been pretty rainy here in TO), so I’ve got quite a few yummy barbecue recipes up my sleeve. Keep your eyes peeled for more summer favourites, for vegetarians and carnivores alike, because I have all your summer favourites on the way, grilled chicken, ribs and even a few more veggie dishes. In the meantime, you can find some inspiration in the form of burgers and barbecue sauce. But let’s talk about the star of this dish; eggplant. How do you feel about this vegetable? I’ve found that it’s one of those ingredients that many people are kind of cool towards. In fact, it wasn’t until a couple of months ago that I started to actually really like eggplant. I’d only ever had it roasted, in my roasted eggplant dip and eggplant salad, but the smokiness the grill brings out is unlike any eggplant I’ve ever tasted. A lot of people ask what eggplant is like? Well the texture is almost meat-like, especially on these skewers, and the flavour is earthy, somewhat neutral and slightly bitter. Eggplant is one of those vegetables (like zucchini) that will soak up so much flavour, so marinating will do wonders for its flavour. I’ve found that eggplant makes a great meat alternative for vegetarians and vegans out there and is a simple preparation that any meat-eater can get behind. Something on a stick? On the grill? It’s just as easy as a chicken skewer! This recipe came about a few weeks ago, originally, I was planning on doing a recipe for vegetable skewers loaded with all sorts of veggies like mushrooms, brussels sprouts and of course eggplant. But then, when I made them, my sister and I both agreed that the eggplant pieces were the best part of the skewers, so I got rid of all the other veggies and these grilled eggplant skewers were born. A quick tip – don’t let them marinate for too long, I left them in the fridge for a few hours and they soaked up all of the oil. Another quick tip, serve these immediately. They aren’t the best as leftovers because again, the eggplants soak up all the liquid and become a little soggy – these skewers are best served hot off the girll. The meaty texture of eggplant works wonderfully in this skewer preparation. The simple combination of oil, garlic, salt and chili flakes is absorbed by the eggplant and creates a complex, somewhat spicy and smoky skewer. These eggplant kebabs are best served right off the grill. Whisk olive oil with garlic, chili flakes and salt. Toss with eggplant, and skewer. Grill for 1-2 minutes per side or until grill marks appear. 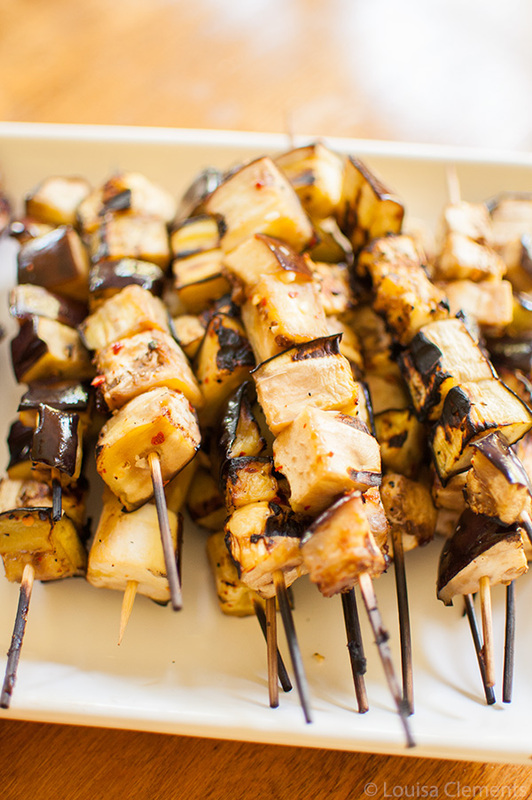 These grilled eggplant skewers are the perfect vegetarian option for grilling – let me know if you give them a try in the comments below.